This article is about the term. For other uses, see Yankee (disambiguation). The term "Yankee" and its contracted form "Yank" have several interrelated meanings, all referring to people from the United States; its various senses depend on the context. According to the Oxford English Dictionary, it is "a nickname for a native or inhabitant of New England, or, more widely, of the northern States generally"; during the American Civil War, it was "applied by the Confederates to the soldiers of the Federal army". In the American South, the term may be used disparagingly and usually refers to Northerners generally. Elsewhere in the United States, it largely refers to people from the Northeastern states, but especially those with New England cultural ties, such as descendants of colonial New England settlers, wherever they live. Its sense is sometimes more cultural than geographical, emphasizing the Calvinist Puritan Christian beliefs and traditions of the Congregationalists who brought their culture when they settled outside New England. The speech dialect of Eastern New England English is called "Yankee" or "Yankee dialect". Outside the US, the informal "Yank" refers to Americans in general. It is especially popular among Britons, Irish, and Australians and sometimes carries pejorative overtones. The root of the term is uncertain. British General James Wolfe made the earliest recorded use of the word Yankee in 1758 to refer to people from what became the United States. He referred to the New England soldiers under his command as Yankees: "I can afford you two companies of Yankees, and the more because they are better for ranging and scouting than either work or vigilance". 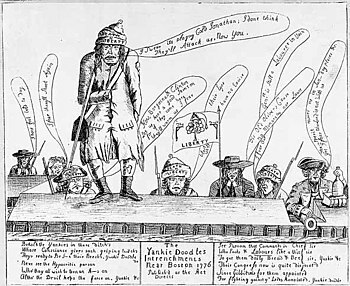 Later British use of the word often was derogatory, as in a cartoon of 1775 ridiculing "Yankee" soldiers. New Englanders themselves employed the word in a neutral sense; the "Pennamite–Yankee War," for example, was a series of clashes in 1769 over land titles in Pennsylvania between "Yankee" settlers from Connecticut and "Pennamite" settlers from Pennsylvania. The meaning of Yankee has varied over time. In the 18th century, it referred to residents of New England descended from the original English settlers of the region. Mark Twain used the word in this sense the following century in his novel A Connecticut Yankee in King Arthur's Court, published in 1889. As early as the 1770s, British people applied the term to any person from the United States. In the 19th century, Americans in the southern United States employed the word in reference to Americans from the northern United States, though not to recent immigrants from Europe. Thus, a visitor to Richmond, Virginia commented in 1818, "The enterprising people are mostly strangers; Scots, Irish, and especially New England men, or Yankees, as they are called". Many etymologies have been suggested for the word Yankee, but modern linguists generally reject theories which suggest that it originated in any Indian languages. This includes a theory purported by a British officer in 1789, who said that it was derived from the Cherokee word eankke ("coward")—despite the fact that no such word existed in the Cherokee language. Another theory surmised that the word was borrowed from the Wyandot pronunciation of the French l'anglais, meaning "the Englishman" or "the English language", which was sounded as Y'an-gee. American musicologist Oscar Sonneck debunked a romanticized false etymology in his 1909 work Report on "The Star-Spangled Banner", "Hail Columbia", "America", "Yankee Doodle". He cited a popular theory which claimed that the word came from a tribe who called themselves Yankoos, said to mean "invincible". The story claimed that New Englanders had defeated this tribe after a bloody battle, and the remaining Yankoo Indians transferred their name to the victors—who were "agreeable to the Indian custom". Sonneck notes that multiple American writers since 1775 had repeated this story as if it were fact, despite what he perceived to be holes in it. It had never been the tradition of any Indian tribe to transfer their name to other peoples, according to Sonneck, nor had any settlers ever adopted an Indian name to describe themselves. Sonneck concludes by pointing out that there was never a tribe called the Yankoos. New Netherland is to the northwest, and New England is to the northeast. 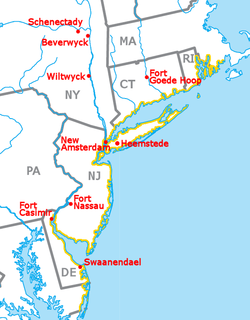 Most linguists look to Dutch language sources, noting the extensive interaction between the Dutch colonists in New Netherland (now largely New York, New Jersey, Delaware, and western Connecticut) and the English colonists in New England (Massachusetts, Rhode Island, and eastern Connecticut). The exact application, however, is uncertain; some scholars suggest that it was a term used in derision of the Dutch colonists, others that it was derisive of the English colonists. Michael Quinion and Patrick Hanks argue that the term comes from the Dutch name Janke, a diminutive form of Jan (John) which would be Anglicized as "Yankee" due to the Dutch pronunciation of J as the English Y. Quinion and Hanks posit that it was "used as a nickname for a Dutch-speaking American in colonial times" and could have grown to include non-Dutch colonists, as well. Alternatively, the Dutch given names Jan (Dutch: [jɑn]) and Kees (Dutch: [keːs]) have long been common, and the two are sometimes combined into a single name (e.g., Jan Kees de Jager). Its Anglicized spelling Yankee could, in this way, have been used to mock Dutch colonists. The chosen name Jan Kees may have been partly inspired by a dialectal rendition of Jan Kaas ("John Cheese"), the generic nickname that Southern Dutch used for Dutch people living in the North. The Online Etymology Dictionary gives its origin as around 1683, when English colonists used it insultingly in reference to Dutch colonists (especially freebooters). Linguist Jan de Vries notes that there was mention of a pirate named Dutch Yanky in the 17th century. The Life and Adventures of Sir Launcelot Greaves (1760) contains the passage, "Haul forward thy chair again, take thy berth, and proceed with thy story in a direct course, without yawing like a Dutch yanky." According to this theory, Dutch settlers of New Amsterdam started using the term against the English colonists of neighboring Connecticut. An early use of the term outside the United States was in the creation of Sam Slick the "Yankee Clockmaker" in a newspaper column in Halifax, Nova Scotia in 1835. The character was a plain-speaking American who becomes an example for Nova Scotians to follow in his industry and practicality; and his uncouth manners and vanity were the epitome of qualities that his creator detested. The character was developed by Thomas Chandler Haliburton, and it grew between 1836 and 1844 in a series of publications. The damned Yankee usage dates from 1812. Confederates popularized it as a derogatory term for their Northern enemies during and after the American Civil War (1861–65). In an old joke, a Southerner alleges, "I was twenty-one years old before I learned that 'damn' and 'Yankee' were separate words". In fact, the spelling "damnyankee" is not uncommon. Another facetious saying is that "a Yankee is someone from the North who visits the South. A damn Yankee is one who moves here." Former Rhode Island Governor Bruce Sundlun was a pilot in World War II, and he named his B-17F bomber Damn Yankee because a crewmen from North Carolina nicknamed him with that epithet. A pervasive influence on the use of the term throughout the years has been the song "Yankee Doodle" which was popular during the American Revolutionary War (1775–83). The song originated among the British troops, creating a stereotype of the Yankee simpleton who stuck a feather in his cap and thought that he was stylish., but it was rapidly re-appropriated by American patriots following the battles of Lexington and Concord. Today, "Yankee Doodle" is the official state song of Connecticut. The term Yankee now may mean any resident of New England or of any of the Northeastern United States. The original Yankees diffused widely across the northern United States, leaving their imprints in New York, the Upper Midwest, and places as far away as Seattle, San Francisco, and Honolulu. Yankees typically lived in villages consisting of clusters of separate farms. Often they were merchants, bankers, teachers, or professionals. Village life fostered local democracy, best exemplified by the open town meeting form of government which still exists today in New England. Village life also stimulated mutual oversight of moral behavior and emphasized civic virtue. From the New England seaports of Boston, Salem, Providence, and New London, among others, the Yankees built international trade routes, stretching to China by 1800. Much of the profit from trading was reinvested in the textile and machine tools industries. Yankee ingenuity was a worldwide stereotype of inventiveness, technical solutions to practical problems, "know-how," self-reliance, and individual enterprise. The stereotype first appeared in the 19th century. As Mitchell Wilson notes, "Yankee ingenuity and Yankee git-up-and-go did not exist in colonial days." The great majority of Yankees gravitated toward the burgeoning cities of the northeast, while wealthy New Englanders also sent ambassadors to frontier communities where they became influential bankers and newspaper printers. They introduced the term "Universal Yankee Nation" to proselytize their hopes for national and global influence. In religion, New England Yankees originally followed the Puritan tradition, as expressed in Congregational churches. Beginning in the late colonial period, many became Presbyterians, Episcopalians, Methodists, Baptists, or, later, Unitarians. Strait-laced 17th-century moralism as derided by novelist Nathaniel Hawthorne faded in the 18th century. The First Great Awakening (under Jonathan Edwards and others) in the mid-18th century and the Second Great Awakening in the early 19th century (under Charles Grandison Finney, among others) emphasized personal piety, revivals, and devotion to civic duty. Theologically, Arminianism replaced the original Calvinism. Horace Bushnell introduced the idea of Christian nurture, through which children would be brought to religion without revivals. After 1800, Yankees spearheaded most reform movements, including those for abolition of slavery, temperance in use of alcohol, increase in women's political rights, and improvement in women's education. Emma Willard and Mary Lyon pioneered in the higher education of women, while Yankees comprised most of the reformers who went South during Reconstruction in the late 1860s to educate the Freedmen. Because they arrived first and had a strong sense of community and mission, Yankees were able to transplant New England institutions, values, and mores, altered only by the conditions of frontier life. They established a public culture that emphasized the work ethic, the sanctity of private property, individual responsibility, faith in residential and social mobility, practicality, piety, public order and decorum, reverence for public education, activists, honest, and frugal government, town meeting democracy, and he believed that there was a public interest that transcends particular and stock ambitions. Regarding themselves as the elect and just in a world rife with sin and corruption, they felt a strong moral obligation to define and enforce standards of community and personal behavior…. This pietistic worldview was substantially shared by British, Scandinavian, Swiss, English-Canadian and Dutch Reformed immigrants, as well as by German Protestants and many of the Forty-Eighters. Yankees dominated New England, much of upstate New York, and much of the upper Midwest, and were the strongest supporters of the new Republican party in the 1860s. This was especially true for the Congregationalists, Presbyterians, and (after 1860) the Methodists among them. A study of 65 predominantly Yankee counties showed that they voted only 40% for the Whigs in 1848 and 1852, but became 61–65% Republican in presidential elections of 1856 through 1864. Ivy League universities remained bastions of old Yankee culture until well after World War II, particularly Harvard and Yale, as well as "Little Ivy" liberal arts colleges. President Calvin Coolidge was a striking example of the modern Yankee stereotype. Coolidge moved from rural Vermont to urban Massachusetts and was educated at elite Amherst College. Yet his flint-faced, unprepossessing ways and terse rural speech proved politically attractive. "That Yankee twang will be worth a hundred thousand votes", explained one Republican leader. Coolidge's laconic ways and dry humor were characteristic of stereotypical rural "Yankee humor" at the turn of the 20th century. By the beginning of the 21st century, systematic Yankee ways had permeated the entire society through education. Many observers from the 1880s onward predicted that Yankee politicians would be no match for the new generations of ethnic politicians, yet the presence of Yankees at the top tier of modern American politics was typified by presidents George H. W. Bush and George W. Bush, and former Democratic National Committee chairman Howard Dean, as well as losing 2004 Democratic presidential nominee John Forbes Kerry, descendant through his mother of the Scottish Forbes family, which emigrated to Massachusetts in the 1750s. "Certainly the Irish have for years complained of Yankee discrimination against them." "There were no civil rights groups then. Even the Federal Government was controlled by bigoted Yankees and Irish who banded together against the Italian immigrant." "The one anomaly of this era was the election of Yankee Republican Leverett Saltonstall as governor in 1938, and even then Saltonstall jokingly attributed his high vote totals in Irish districts to his 'South Boston face'." In the southern United States, the term is used in derisive reference to any Northerner, especially one who has migrated to the South. Senator J. William Fulbright of Arkansas pointed out as late as 1966, "The very word 'Yankee' still wakens in Southern minds historical memories of defeat and humiliation, of the burning of Atlanta and Sherman's March to the Sea, or of an ancestral farmhouse burned by Quantrill's Raiders". Ambrose Bierce defines the term in The Devil's Dictionary as: "In Europe, an American. In the Northern States of our Union, a New Englander. In the Southern States the word is unknown. (See DAMNYANK.)" Major League Baseball's New York Yankees acquired the name from journalists after the team moved from Baltimore in 1903, though they were officially known as the Highlanders until 1913. The regional Yankees–Red Sox rivalry can make the utterance of the term "Yankee" unwelcome to some fans in New England, especially to the most dedicated Red Sox fans living in the northeastern United States. The term Swamp Yankee is sometimes used in rural Rhode Island, Connecticut, and southeastern Massachusetts to refer to Protestant farmers of moderate means and their descendants (in contrast to richer or urban Yankees); "swamp Yankee" is often regarded as a derogatory term. Scholars note that the famous Yankee "twang" survives mainly in the hill towns of interior New England, though it is disappearing even there. Mark Twain's novel A Connecticut Yankee in King Arthur's Court popularized the word as a nickname for residents of Connecticut, and Connecticut Air National Guard unit 103d Airlift Wing is nicknamed "The Flying Yankees." The shortened form Yank is used as a derogatory, pejorative, playful, or colloquial term for Americans in Britain, Australia, Canada, South Africa, Ireland, and New Zealand. Depending on the country, Yankee may be considered mildly derogatory. In Cockney rhyming slang, an American is a Septic or Seppo, derived from "Septic Tank", "Yank". Venezuelan Spanish has the word pitiyanqui, derived c 1940 around the oil industry from petty yankee or petit yanqui, a derogatory term for those who profess an exaggerated and often ridiculous admiration for anything from the United States. In the late 19th century, the Japanese were called "the Yankees of the East" in praise of their industriousness and drive to modernization. In Japan, the term Yankī has been used since the late 1970s to refer to a type of delinquent youth. In Finland, the word jenkki (yank) is sometimes used to refer to any US citizen, and Jenkkilä (Yankeeland) refers to the United States itself. It is not considered offensive or anti-American, but rather a colloquial expression. Yankee is the code word for the letter "Y" in the NATO phonetic alphabet. ^ a b Ruth Schell (1963). "Swamp Yankee". American Speech. 38 (2): 121–123. doi:10.2307/453288. JSTOR 453288. ^ Robert Hendrickson (2000). The Facts on File Dictionary of American Regionalisms. Infobase. p. 326. ^ "Cambridge Advanced Learner's Dictionary Online". Cambridge University Press. ^ a b c d The Merriam-Webster new book of word histories (1991) pp. 516–517. ^ The Wyandot people were called Hurons by the French. ^ Mathews (1951) p. 1896. ^ This is not to be confused with adopting an Indian name for a geographical location. ^ Sonneck, O. G. (2001). Report on "The star-spangled banner", "Hail Columbia", "America", "Yankee Doodle. Honolulu, Hawaii: University Press of the Pacific. p. 83. ISBN 0898755328. ^ a b Harper, Douglas. Online Etymology Dictionary: "Yankee". 2013. Accessed 13 Jul 2013. ^ de Vries, Jan (1971). Nederlands Etymologisch Woordenboek (in Dutch). Headword: yankee. ^ Cogswell, F. (2000).Haliburton, Thomas Chandler. Dictionary of Canadian Biography Online, Volume IX 1861–1870. University of Toronto/Université Laval. Retrieved on: 2011-08-15. ^ "41-24557 B-17 FLYING FORTRESS". American Air Museum in Britain. Retrieved 21 Feb 2019. ^ Johann Willaert. "My 68th Anniversary Tribute to B17-F Damn Yankee". The US Militaria Forum. Retrieved 21 Feb 2019. ^ Mooney, Mark (14 July 2014). "'Yankee Doodle Dandy' Explained and Other Revolutionary Facts". ABC News. Retrieved 6 May 2016. ^ Kenneth J. Winkle (2001). The Young Eagle: The Rise of Abraham Lincoln. Taylor. p. 78. ^ William Allen White, A Puritan in Babylon: The Story of Calvin Coolidge (1938) p. 122. ^ Arthur George Crandall, New England Joke Lore: The Tonic of Yankee Humor, (F.A. Davis Company, 1922). ^ Whyte, William F. (December 1939). "Race Conflicts in the North End of Boston". The New England Quarterly. 12 (4): 623–642. JSTOR 360446. ^ Langone, Fred (1994). The North End: Where It All Began. Boston: Post-Gazette, American Independence Edition. p. 3. ^ Puleo, Stephen (2007). The Boston Italians. Boston: Beacon Press. p. 185. ISBN 9780807050361. ^ Fulbright's statement of March 7, 1966, quoted in Randall Bennett Woods, "Dixie's Dove: J. William Fulbright, The Vietnam War and the American South," The Journal of Southern History, vol. 60, no. 3 (Aug., 1994), p. 548. ^ Society, National Geographic (2012-11-19). "Yankee". National Geographic Society. Retrieved 2018-09-23. ^ Bodley, Hal (October 20, 2004). "Red Sox-Yankees is baseball's ultimate rivalry". USAToday.com. ^ Eli Daniel Potts, and Annette Potts, Yanks Down Under, 1941-45: The American Impact on Australia. (1985). ^ "Hippies, Muslims and Yanks march against Bush | IOL News". South African Press Association. Retrieved 2018-06-15. ^ Green, Jonathon (1998). Cassell Dictionary of Rhyming Slang. London: Cassell. p. 1048. ^ "A Little Insult Is All the Rage in Venezuela: 'Pitiyanqui'", The New York Times. Logemay, Butsee H. "The Etymology of 'Yankee'", Studies in English Philology in Honor of Frederick Klaeber, (1929) pp 403–13. Stollznow, Karen. 2006. "Key Words in the Discourse of Discrimination: A Semantic Analysis. PhD Dissertation: University of New England., Chapter 5. Wikisource has the text of the 1911 Encyclopædia Britannica article Yankee.